If it rains, the show will be performed inside Woodlawn Arts Academy! Check the SVCC Facebook page for information regarding rain and location. We know the classic stories: an adventure that begins with a shoe or a beanstalk, some crazy hair or a cape. While Into the Woods tells the story of these beloved fairy tale characters, what we know may not be the whole story. Cinderella, Jack and the Beanstalk, Rapunzel, and Little Red Riding Hood collide with a new fairy tale about a Baker and his wife in a musical that explores the true meaning of happily ever after. These characters must face their deepest fears as they fight their way through the woods. When witches, wolves, and giants are not the worst things to be encountered, sometimes we must be careful what we wish for and sometimes we must dare to wish again. “Witches can be right, giants can be good” and the classic stories we tell may contain lessons we never realized before. discretion as they know their children’s sensitivities and maturity levels best. The first act is lighter in tone than the second. The show contains some mature content. 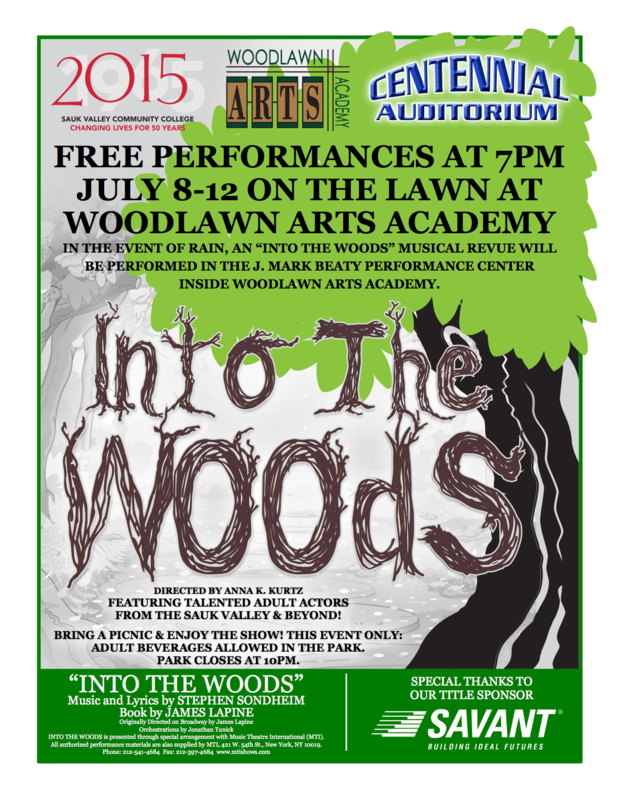 This summer Shakespeare in the Park broadens its horizons with the presentation of the musical Into the Woods. While Shakespeare will always be the heart of this summer event, our hope is to include other classic works into our repertoire as we strive to provide the Sauk Valley area with quality, entertaining, and culturally enriching theatrical experiences. Join us July 10 for Shakespearience! A special presentation of Shakespeare scenes from local youth talent. The scenes will be developed in two week camps and will be performed on the Shakespeare in the Park stage at 6 PM. Contact Woodlawn Arts Academy to register or contact anna.k.kurtz@svcc.edu for more information. Tickets for the Shakespeare in the Park are FREE! Chairs are not available. Audiences are encouraged to bring blankets and lawn chairs. Audiences may also bring food and drinks including adult beverages. Please check the SVCC Facebook page or this web page for possible rain changes. In the event of rain, the show will be performed inside Woodlawn Arts Academy! Sauk Valley Theatre Alliance is a cooperative agreement among Sauk Valley Community College, Woodlawn Arts Academy, and Sterling Public Schools (Centennial Auditorium).